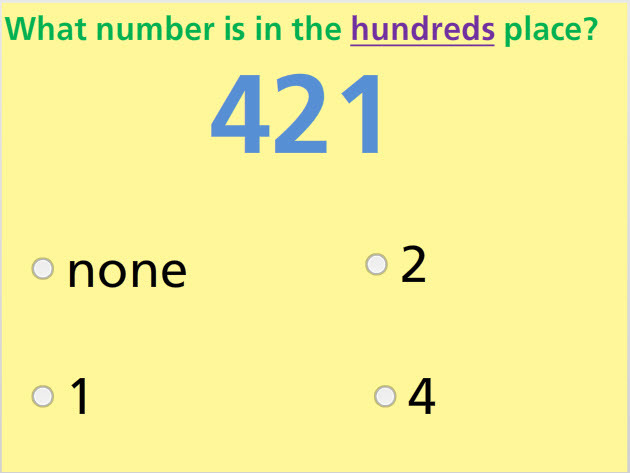 Identify the place value of numbers up to the hundreds place in this fun math test. Some of the problems require the student to identify the number in the tens place. Some problems focus on the ones place. Some require the student to identify the number in the hundreds place. Also, some problems require the student to drag the place value and drop it next to the correct underlined number. Return from this Place Value Hundreds Place Math Test to the Elementary Math Tests , 2nd Grade Math Tests webpage, or to Math Tests.